Eczema (also known as atopic dermatitis) is the most common inflammatory skin disease, affecting approximately 25% of children and between 3-8% of adults in the developed world. One of the key building blocks of a healthy skin barrier is a protein called filaggrin, which is defective in patients with eczema. 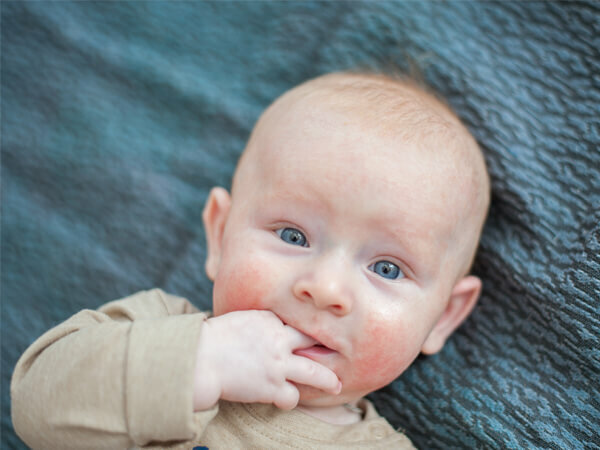 Eczema in babies often starts on the cheeks and is associated in many cases with food allergy. In older childen and adults eczema can affect different sites. In a recent study, conducted as part of her NCRC funded PhD, Dr Maeve McAleer, under the supervision of Professor Alan Irvine, together with colleagues based in Ireland, the Netherlands, and the UK, aimed to learn about the normal development of the skin barrier from day 2 of life through to 6 years, looking at body sites that are particularly prone to eczema. They did a painless test called tape stripping in more than 120 babies and children which allowed them to study in detail many molecules derived from the breakdown of filaggrin as well as many other enzymes involved in processing this protein. They also looked at how strong and robust the skin surface cells were. They showed that cheek skin in babies and young childen is particularly slow to mature compared to other sites. The skin at this site is low in filaggrin, has weaker skin cells and more molecules causing breakdown of the barrier compared to other sites. These findings help us understand why eczema often starts on the cheeks in babies. The authors suggest that this vulnerable site may also be important for the development of food allergies in babies. Learn more about Dr McAleer’s work by clicking here!